The major Cdn$32.1 billion in oilsands mining deals that were announced in March dominated Canadian M&A activity during the first seven months of 2017, as they comprised 87% of the overall value of transactions. But it’s important we don’t allow this to skew the significance of other deals agreed and completed this year. 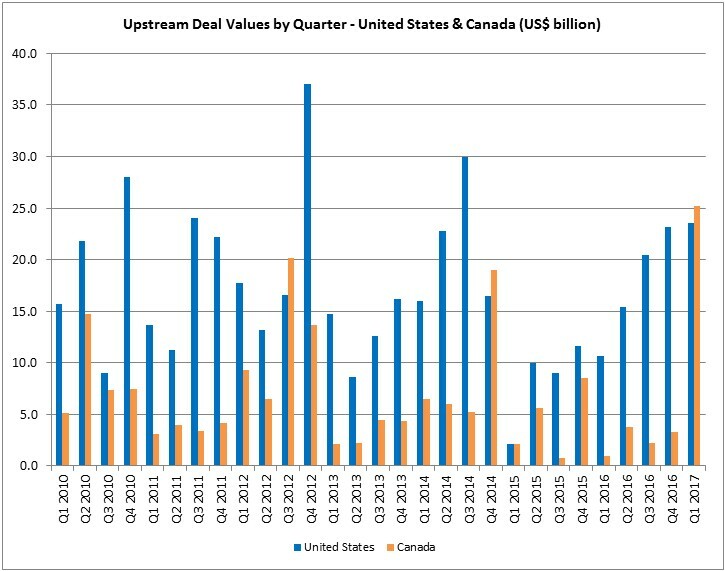 New analysis in CanOils’ latest M&A report illustrates that upstream activity picked up in terms of overall deal values throughout Q2, but the actual number of deals dropped off in June. After the second quarter ended, even though the number of new deals stayed flat, July saw three of Canada’s largest deals outside of the oilsands sector to boost deal totals. Below are the top 10 upstream deals in Canada this year so far, away from the four huge deals in the oilsands mining sector, according to CanOils M&A data. For more on each individual deal, download the relevant monthly M&A review at the link provided. The company to agree the largest single sale of 2016 has also agreed the largest non-oilsands acquisition of 2017 so far. Paramount Resources Ltd. (TSX:POU), a company that made headlines with its Cdn$1.9 billion sale of western Canadian assets to Seven Generations Energy Ltd. (TSX:VII) last year, agreed a deal for over Cdn$850 billion for the 85% stake in Trilogy Energy Corp. (TSX:TET) it did not already own. The deal will see Paramount issue Trilogy shareholders with around Cdn$455 million in Paramount stock, while the rest of the consideration is made up of Trilogy debt to be assumed, according to Trilogy’s balance sheet in Q2 2017. For more on the largest non-oilsands deal of 2017 so far, download the NEW CanOils M&A Review for July 2017. This deal was a completely international affair, with the UK’s Centrica Plc (LSE:CNA) and Qatar Petroleum deciding to sell their respective 60% and 40% interests in the CQ Energy Canada Partnership to a consortium led by Chinese-backed MIE Holdings Corp. The deal will see the selling parties receive a share of Cdn$722 million proportionate to their ownership stake in the partnership. Centrica, having sold its interests in Trinidad and Tobago in a US$30 million deal to Royal Dutch Shell (LSE:RDSA), has now switched its E&P focus entirely to Europe, and this week signed a new joint venture agreement with Bayerngas Norge. For more on the sale of the CQ Energy Canada Partnership, download the CanOils M&A Review for June 2017. The largest deal to involve a Canadian-headquartered company outside of the oilsands sector this year so far saw Waterous Energy Fund become the largest single stakeholder in Northern Blizzard Resources Inc. (TSX:NBZ). Since this deal completed in May, Northern Blizzard has changed its name to Cona Resources Ltd. and is now listed under the ticker “CONA” on the TSX. Waterous acquired its 67% majority stake for Cdn$244 million in cash and Northern Blizzard’s net debt position was Cdn$223 million in Q1 2017, net to this 67% stake. The company produced just over 11,500 boe/d net to Waterous’ position in Q1, representing a cost of Cdn$40,400 per flowing barrel. For more detail on this deal, download our M&A reports for April and May 2017. Paramount’s other huge deal this year was unveiled in the same press announcement as the Trilogy purchase. Paramount will be acquiring the remaining Canadian assets held by Apache Corp. (NYSE:APA) for Cdn$460 million. Unlike the Trilogy deal, no debt will be assumed and Paramount will fulfil the consideration using cash on hand rather than issuing stock. Before the larger deal with Paramount was agreed, Apache had already agreed a Cdn$300 million deal with Cardinal Energy Ltd. (TSX:CJ) to sell light oil assets in the Weyburn/Midale area of southeast Saskatchewan and the House Mountain area of Alberta. This deal saw Cardinal’s production boosted by 5,000 boe/d, while light oil now makes up a much larger proportion of the company’s portfolio at 45% compared to medium oil output. For more on this deal, download the CanOils M&A Review for June 2017. Pengrowth Energy Corp. (TSX:PGF) has been arguably the busiest seller during the first two quarters. Its Cdn$300 million deal in early July is the largest and most recent of the company’s divestitures so far in 2017 and reduces Pengrowth’s predicted 2017 production by just under 14,000 boe/d at a cost of Cdn$21,600 per flowing barrel. Painted Pony Petroleum Ltd. (TSX:PPY) completed its acquisition of UGR Blair Creek Ltd. in May from Unconventional Resources Canada LP (“URC”). The deal consideration of Cdn$294 million included Cdn$48 million in net debt assumption and was otherwise satisfied via the issuance of 41 million new Painted Pony shares to URC. Painted Pony now anticipates its 2017 annual average daily production to increase by 12% and also expects to exit 2017 with production of over 73,000 boe/d. For more on this deal, download our M&A review for March and May 2017. The only deal in this list to be announced in the relatively barren first two months of 2017. At the time, the consideration was unknown, but in March, it was confirmed that the company now known as West Lake Energy Ltd. had acquired the assets of the insolvent Twin Butte Energy Ltd. for around Cdn$201 million. Before being forced into receivership by its banking syndicate last September, Twin Butte had medium and heavy oil production of approximately 12,700 boe/d in east-central Alberta and southwestern Saskatchewan. For more details on this deal (before a consideration was confirmed), download our January 2017 M&A review. This was actually the second deal that Pengrowth Energy agreed in the Swan Hills area of north central Alberta this year, but the first of those deals has since been cancelled due to issues faced by the acquiring party in securing finance. This second deal, originally announced in April, saw Pengrowth part with 5,150 boe/d of oil-weighted production at a cost per flowing barrel of just under Cdn$36,000. In July, Pengrowth stated that it had agreed deals that helped the company reduce its net debt position by 66% and only saw proved and probable reserves decrease by 16%. For more on this deal in Swan Hills, download our April 2017 M&A review. Paramount preceded its two huge July acquisitions by making a Cdn$150 million asset sale in the Valhalla area of Alberta in May. The buyer was not named and Paramount did not divulge a specific rationale for the agreement. The divested assets comprise of 74 net sections of land and produced 1,400 boe/d in Q1 2017, representing a cost of over Cdn$100,000 per boe to the acquirer. For more on this deal, download our May 2017 M&A review. 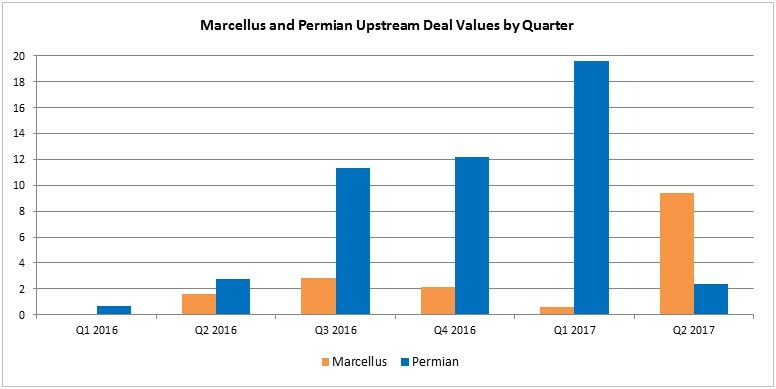 The Marcellus shale stepped out of the huge shadow cast by the Permian Basin and recorded the largest single upstream M&A deal of Q2 2017, according to new analysis in Evaluate Energy’s Q2 2017 Upstream Deals review, which can be downloaded here. The deal will see EQT Corp. (NYSE:EQT) acquire Rice Energy Inc. (NYSE:RICE) for US$8.2 billion, comprised of stock, cash and the assumption of US$1.5 billion in debt. The Marcellus also saw another significant deal in Q2, whereby Noble Energy Inc. (NYSE:NBL) agreed to sell its position in the play for just over US$1 billion. In total, deals involving Marcellus assets totalled US$9.4 billion in Q2 2017; the highest ever quarterly M&A spend in the play. The largest single deal in the Permian this quarter was just over US$600 million. In total, the basin completely bucked recent trends with just US$2.4 billion in new deals – its lowest total since Q1 2016. Throughout the oil price downturn and the rest of 2016, the Permian Basin has been the hotbed of upstream M&A activity, not just in the United States, but worldwide. The Permian, with its strong economic rationale, profile and drilling activity levels, has seen deals totalling over US$61 billion since the end of 2014, representing 15% of the global upstream total. Furthermore, Q1 2017 saw the largest single quarterly outlay that the basin has ever seen at US$19.6 billion. That’s not to say the Marcellus didn’t have any activity throughout 2016. In fact, as we wrote a few months ago, 2016 saw a resurgence in demand for asset packages in the gigantic gas play in the Appalachian basin. But over the past year and up until Q2, M&A has clearly been dominated by the Permian. This quarter also saw U.S. assets change hands in the San Juan and Piceance basins, with ConocoPhillips (NYSE:COP) and Encana Corp. (TSX:ECA) trimming non-core operations. 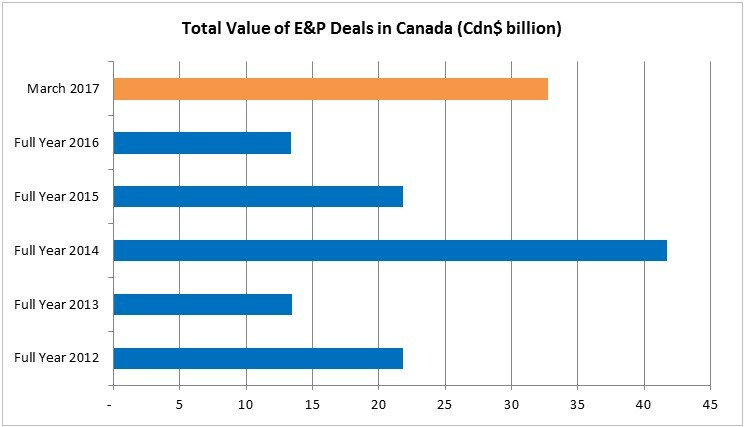 Outside of the U.S., last quarter’s major deals in the Canadian oilsands completed while two major European utilities in France’s ENGIE and Denmark’s DONG Energy agreed deals to sell most or all of their E&P business segments. DONG is exiting the sector completely, while ENGIE will be retaining a minority stake in a large Algerian gas field. For more on all of these stories and detailed single deal analysis, download the Evaluate Energy Q2 2017 M&A review here. Proved oil and liquids reserves for 67 U.S.-listed companies fell for the second year in a row in 2016, according to fresh analysis from the U.S. Energy Information Administration (EIA) using Evaluate Energy data. 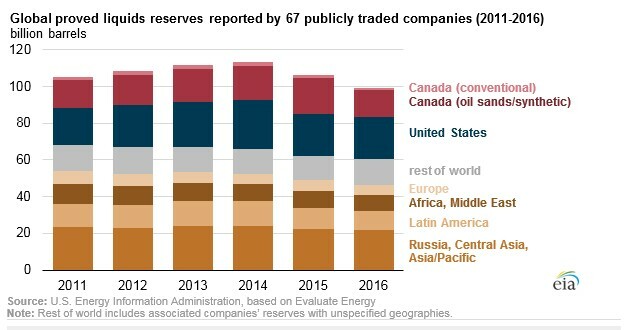 The EIA’s analysis, which can be viewed in full at this link, concludes that the decline was primarily due to a handful of larger companies recording a significant drop in Canadian oilsands reserves. Other causes listed by the EIA include high production levels, downward revisions of existing resources and relatively low levels of extensions and discoveries. The full article, which also includes analysis on these 67 companies’ production portfolios, is available at this link. EIA has also released its annual financial review for global oil and gas in 2016, which can be downloaded here. This report is also based entirely on oil and gas company data provided by Evaluate Energy. This summer, the costs to drill and complete horizontal wells within the Cardium formation are up to 63% cheaper than the most expensive horizontal wells elsewhere in Alberta. That is according to the latest PSAC well cost data for summer 2017, which includes detailed cost estimates for many directional, horizontal and vertical type wells across all major western Canadian regions and formations. Recently, the Cardium has been one of the most active formations within Alberta, with more than 2,000 wells in production today that were licensed within the past five years. In total, the PSAC study for summer 2017 covers 18 carefully-selected horizontal or directional type wells of varying lengths across various formations and depths in Alberta, to provide a detailed overview of typical drilling costs in the province. 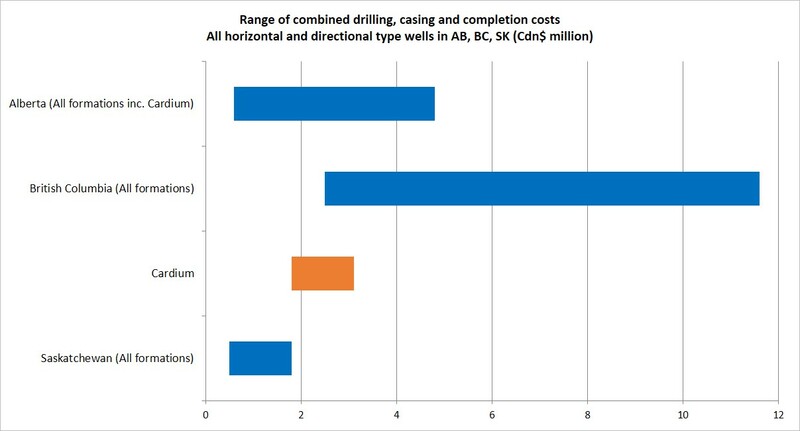 The data, collected and assembled by independent drilling experts, shows that these 18 representative Alberta wells range in costs to drill, case and complete from Cdn$0.6 million to Cdn$4.8 million. 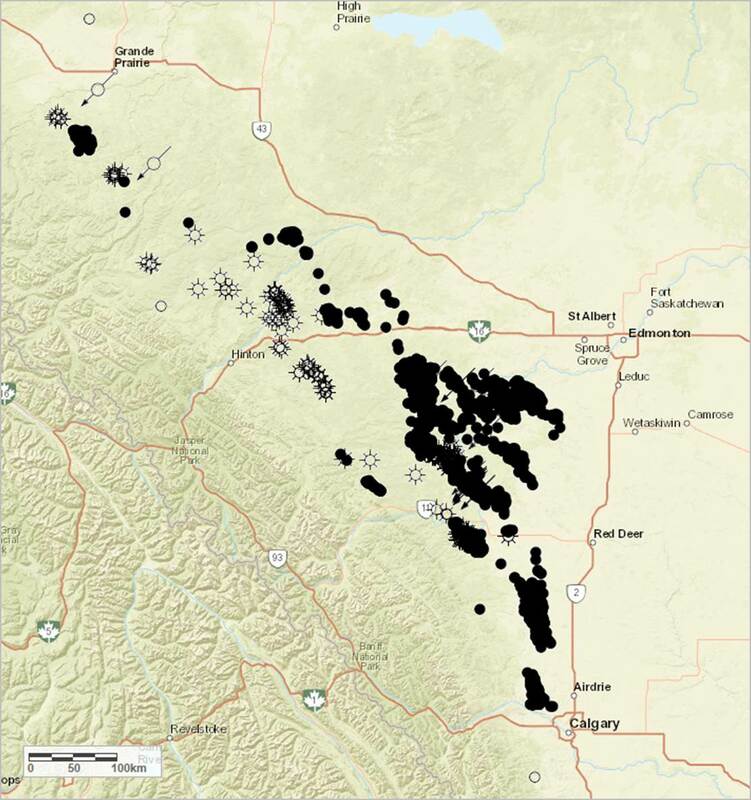 The five Cardium type wells within this group range in costs from Cdn$1.8 million to Cdn$3.1 million, meaning that costs for Cardium operators are in the mid-to-low range of Alberta drilling costs. The data also shows that, on average, horizontal wells in the Cardium are more expensive to drill than typical horizontal and directional wells in Saskatchewan, but mostly cheaper than horizontal wells in British Columbia. The PSAC study includes seven horizontal and directional type wells in Saskatchewan of varying lengths across various depths and formations, which range from Cdn$0.5 million to Cdn$1.3 million to drill, case and complete. This stands in stark contrast to British Columbia, where the costs of the four horizontal wells included in the study range far more wildly from Cdn$2.5 million up to almost Cdn$12 million, due to costs attached to the deepest wells within the relatively ultra-expensive Horn River Basin. Full details on all drilling costs for all Cardium type wells in the Foothills, Foothills Front and Central Alberta PSAC regions of Alberta, are available in the PSAC well cost study. Find out more about the study and accessing the data here. 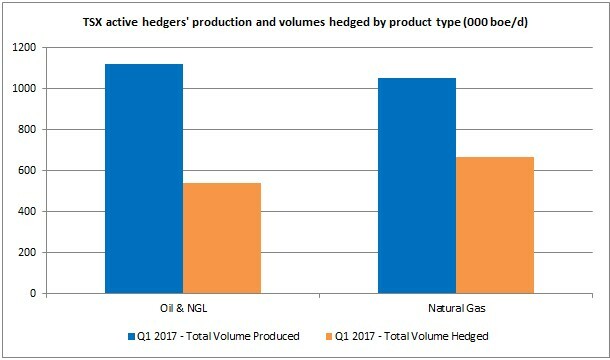 Active hedgers among the TSX-listed oil and gas producers covered 63% of their combined natural gas production – and 48% of combined oil production – with a range of hedging contracts in Q1 2017. Data from CanOils’ updated hedging contracts module shows that, in Q1 2017, there were 42 TSX-listed companies with hedging contracts covering more than 10% of their oil and gas production portfolios. These companies eventually produced 1.1 million boe/d of oil and natural gas liquids (NGLs) and 6.3 bcf/d of natural gas between them during this period. See: Why do oil and gas companies hedge? Source: CanOils Hedging, find out more here. This apparent caution may be one reason behind the type of hedging contract that was most prevalent among the gas producing peer group. Swaps – Either a fixed sales price or a pre-defined differential percentage to any given commodity pricing benchmark is agreed beforehand for a given volume of production over a given period of time. Collars – A company agrees a ceiling and floor price for a pre-defined volume of their production to be sold over a given period of time. If the pre-defined pricing benchmark goes over the ceiling price, the production is sold at the ceiling price, and if the benchmark drops below the floor, it is sold at the floor price. Slightly riskier than the swap, as you have less certainty. Three-way collars have been included here too. A three-way collar is a cheaper option than a standard two-way collar for the oil or gas producer but also introduces a sub-ceiling price to give the company issuing the hedge a greater level of protection. Due to their lower cost, three-way collars tend to be more appealing to smaller producers. Other – a selection of less common contract types have been included in this category, including various types of puts, calls and spreads. 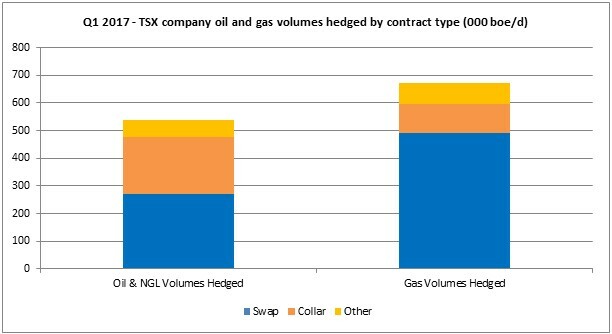 CanOils’ hedging data shows that at the start of Q1 2017 among the TSX’s active hedgers, gas producers were covered by far more swap deals than any other type of contract. 73% (or 491,000 boe/d) of all gas production that was hedged in Q1 2017 was hedged in a swap deal. While caution or a greater need for cash flow certainty – depending on how you look at it – is likely one reason behind this, it could also be that collars or other contract types were simply either not available or less attractive cost-wise for natural gas this quarter. “Swaps are also simpler than other contract types,” adds Li. Swaps were also the most common oil contract too, but only 50% (269,000 boe/d) of all oil hedged by TSX companies in Q1 2017 was under a swap deal, with collars and three-way collars relatively more popular for oil producers. This relative increase in popularity could be down to the fact that oil prices have fluctuated to a far higher degree than gas prices in recent times. No doubt oil producers were eager to enjoy at least some of the upside of any sustained price increase that this fluctuation may yield, despite the slightly increased risk to their cash flow positions. All data on active hedging contracts for Q1 2017 was taken from each company’s financial report or management, discussion and analysis (MD&A) report for the three month period ending Dec 31, 2016. CanOils hedging data includes all contracts that every TSX and TSX-V company has in place, including those active in future periods. All production data was taken from each company’s MD&A for the three month period ended March 31, 2017. Hedging oil and gas production for months or even years into the future is a vital tool for companies to provide certainty to their cash flow statements, by potentially securing future revenues for a specific, pre-determined period of time. For details on CanOils’ new and improved hedging module, please click here. While entering into a hedging contract means that producers forgo the benefits of any significant commodity price increase, the company is simultaneously protected against a dramatic decline in prices. Some companies may value this cash flow certainty over the potential upside at any given time for many different reasons. For example, there may be companies that have huge capital expenditure plans to create significant production growth for the next few years, and while the upside of a short-term price increase is appealing, it is not worth jeopardising any growth plans should prices actually decline. So these companies may elect to take out a hedging contract to ensure its budget is safe for the future of the company. Some companies may just want to keep dividend payments stable in difficult times to avoid losing investors, while others could be at or close to their break even already in terms of commodity prices. Agreeing hedging deals would help to ensure the company stays afloat through a difficult period and is protected against any further fall in prices. There may also be companies that are in a position where external finance (e.g. raising cash by securing new debt or issuing new shares) may be unavailable, unwanted or hard to come by; hedging contracts can act as an alternative funding guarantee. Of course, not all companies take this approach at all for various reasons; indeed, some of even the TSX’s largest producers including Suncor Energy Inc. and Husky Energy Inc. do not hedge. But for those that do, it is possible to partly decipher each company’s attitude to price risk through their own hedging contract portfolio. Every TSX and TSX-V-listed company’s outstanding hedging contracts active in 2017, 2018 and even 2019 is available in the new and improved CanOils hedging module. For more information on the module and the data provided, click here. 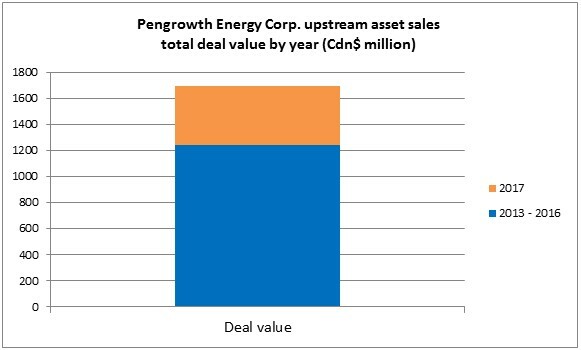 New data available in CanOils’ M&A review for April 2017 illustrates the flurry of sales activity undertaken by Pengrowth Energy Corp. (TSX:PGF) since 2013 – with deals for its assets totalling more than Cdn$1.7 billion. Almost Cdn$460 million of these deals have been agreed since the start of 2017, with the company having been strongly focused on debt repayment in recent periods. The company’s most recent sale, a Cdn$185 million sale in the Swan Hills area, is featured heavily in CanOils’ latest report alongside all major April upstream deals in Canada. In total, the month witnessed Cdn$855.5 million in new upstream deals announced for E&P assets across the whole of Canada, meaning Pengrowth’s most recent deal was around 22% of the overall April total. For more on all this month’s activity, download the report here. 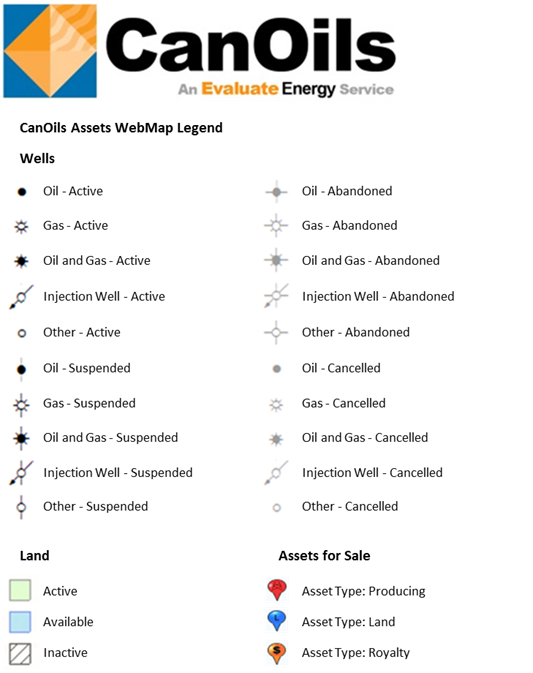 The report also provides analysis on every new upstream asset that was listed for sale in Canada this month. While the size of assets was well below the rolling 12-month average of 20,000 boe/d, April did see some interesting minor assets put up for sale. For more, download CanOils’ M&A review for April 2017 here. 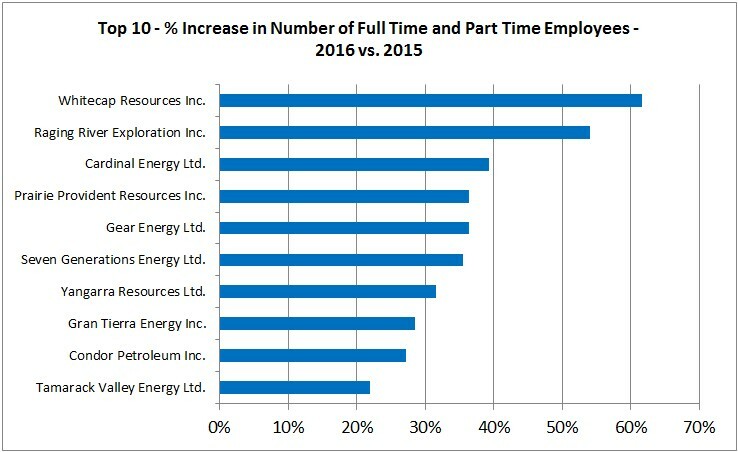 Whitecap Resources Inc. and Raging River Exploration Ltd. saw full time and part time employee numbers increase by a combined 62% and 54%, respectively, between 2015 and 2016, according to annual data available on CanOils. The two companies top the list of TSX producers to increase employee numbers this past year, despite the continued challenging environment for oil and gas producers worldwide. 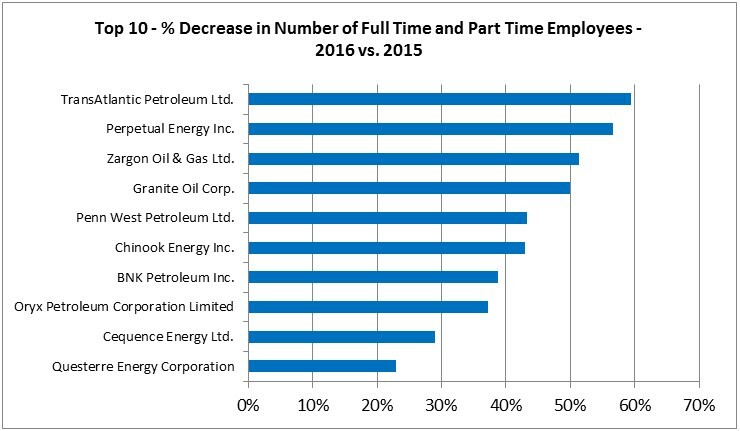 At the other end of the spectrum, the TSX companies to let the highest portion of employees go this year were TransAtlantic Petroleum Ltd. and Perpetual Energy Inc. These companies cut their workforces by 59% and 57%, respectively, between 2015 and 2016. Note: All figures include full and part time employees only. Consultants or contractors are excluded. 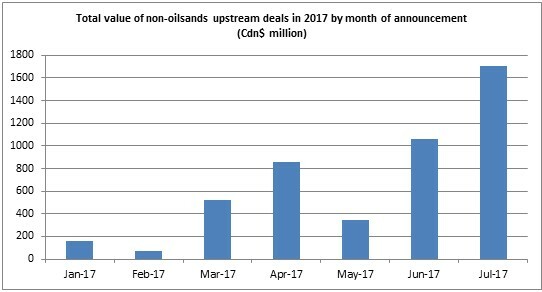 Major deals in the oilsands sector this month meant that the total upstream M&A spend in March 2017 alone eclipsed the annual totals for each of the past five years except for 2014, according to CanOils’ latest monthly M&A review, which can be downloaded here. Cdn$32.1 billion of the total Cdn$32.8 billion spend in March revolved around oilsands assets. Cenovus Energy Inc. (TSX:CVE) bought out its 50% joint venture partner, ConocoPhillips (NYSE:COP) in the FCCL partnership, Canadian Natural Resources Ltd. (CNRL, TSX:CNQ) acquired a 70% interest in the AOSP from Royal Dutch Shell (LSE:RDSA) and Marathon Oil Corp. (NYSE:MRO). Shell itself also acquired a minor stake in AOSP from Marathon to complete the spending. Away from the oilsands, it was also a relatively busy month considering recent deal trends, with over Cdn$700 million spent on conventional and resource play assets. The largest deal saw Painted Pony Petroleum Ltd. (TSX:PPY) acquire 8,500 boe/d of new Montney production, while Enerplus Corp. (TSX:ERF) and Pengrowth Energy Corp. (TSX:PGF) agreed significant asset sales as well. March also saw Cenovus place nearly 30,000 boe/d of gas weighted production over 1 million acres up for sale. Birchliff Energy Ltd. (TSX:BIR) and Insignia Energy Ltd. (TSX:ISN) were among the other companies to list assets for sale this month. For full analysis on all these deals and assets for sale, as well as an outlook for the Canadian oilsands industry, download the CanOils Monthly M&A Review for March 2017 here. Q1 2017 saw the highest outlay on global upstream oil and gas M&A for almost two years, with US$65.1 billion in deals declared, according to Evaluate Energy’s latest M&A review. The previous biggest quarter in terms of value was Q2 2015, when Royal Dutch Shell acquired BG Group. This quarter’s total was in fact the fifth largest quarterly spend since Q1 2010. This quarter’s deal value was of course driven by the significant US$24.5 billion spend in the Canadian oilsands sector, with Cenovus Energy Inc. (TSX:CVE), Canadian Natural Resources Ltd. (TSX:CNQ) and Royal Dutch Shell (LSE:RDSA) all agreeing deals that significantly altered the oilsands landscape during March. 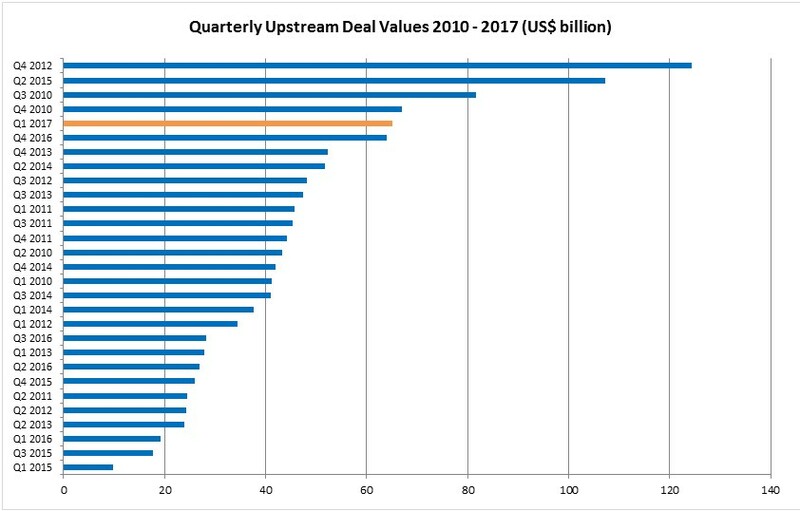 It was actually only the fourth time in seven years that Canada saw a greater overall deal value in a quarter since the start of 2010. Speaking of the United States, it was a record setting quarter for the increasingly popular Permian Basin, where US$18.5 billion in new upstream deals were announced. ExxonMobil Corp. (NYSE:XOM), Noble Energy Inc. (NYSE:NBL) and Parsley Energy Inc. (NYSE:PE) were among the acquirers in the basin this quarter. For full details and the usual in-depth analysis on all the major deals in North America and around the world, access Evaluate Energy’s global M&A review for Q1 2017 by downloading the report here.